After all this planning and booking for Peru, I realized I have to get back into the swing of my backpacking ways. It’s been actually a long time since I have just “wing it”. It’s crazy how time passes so quickly. My last backpacking adventure was Argentina and Chile. Scary thought, knowing that was over 2 years ago! Back in the day I always kept up with the one BIG backpacking trip per year. But with life getting so busy, it’s so easy to ask where the time went. At least the small trips are always there, with 3 under my belt this year; Las Vegas, New Orleans, and Chicago. I shouldn’t really complain but ekkk….. two years of not wandering around a country is a LONG time for me! Since it has been so long since backpacking for me, I decided to book most of the hostels, trains, and tours ahead of time. Just to feel that extra safety net, but at the same time I hope planning so far in advance won’t hinder any random fun activities. A few things I had to book in advance, such as the train to Machu Picchu and the entrance fee. I was so excited yesterday because I got one of the last booking spots to experience the sunrise on Huayba – Machu Picchu. Limited amounts of people are allowed to climb up to Huayba to see the sunrise at 7:30am. And I got one of the spots! WHOOOOO. With that being said, I also booked a tour in the Amazon for two nights. It’s a kayaking tour, which will be interesting considering I rarely kayak. So with a few booked activities underway the next step is figuring out what to bring. The weather is suppose to mildly warm in most areas of Peru, but I was told that Puno can reach negative five during the evenings. That won’t be so enjoyable since I haven’t been in cold weather for the past four months. My backpack will have to be neatly organized with lots of cool wear, hiking gear, and a few jackets for those cool nights. I must keep in mind that for most of this trip I will be in the outback and enjoying the nature things. It’s not one of my typical adventures, where many cities are apart of the journey. If anyone knows, what the ideal backpacking gear would be to bring for my trip to Peru in October, write me a quick email. I would love to hear your ideas and advice. With the long week-end approaching, Nara and I are particularly excited because it means we’ll be seeing each other! With her living in Toronto and I in Montreal, we normally make it a point to see each other every few months. But unfortunately, the last time we saw each other was February so we are long overdue to spend some time together and with friends. For the both of us, long week-end normally translates in road-trip, and so, we are planning for a camping trip at Bon Echo Provincial park in Ontario. Although it’s a few hours away from both of our cities, it’s renowned to be a good provincial park and we’re looking forward to it. When most people hear the word “camping”, they think about mosquitoes, lack of bathrooms, dirt, etc. That would probably be a good description for rustic camping but provincial parks in Canada are well equipped. So the camping we’re referring to is with nearby bathroom facilities, electricity and water. I’ll save the rustic camping occasions when I’m backpacking somewhere exotic. With only a few days away from leaving on a camping trip, I need to think of items to pack. Tent, sleeping bags, mattresses and tarp: These are pretty much the basic necessities for camping. Putting up the tent will be an interesting task of its own but we should be able to put it up without too much difficulty. Tarp is always useful when it rains. I normally put one over the tent and keep an extra one in the car to put over the table if it rains. Hammer, machete knife, flashlight and lantern: These items will also come in very useful. We’ll need a hammer to put up the tent. The knife is always useful, either to cut food or difficult items to cut with a regular knife. The flashlight and lanterns will be handy once it’s dark. Camping/portable stove and grill for campfire: The portable stove is not a necessary item because you can easily cook using the fire and a grill. But, since I mentioned that I’m going on a slightly more luxurious camping trip, the portable stove is coming with up. I plan to make the eggs or boil water or tea or even make some coffee. Plastic plates, garbage bags, cloths, dish soap and pan: While trying to use plastic plates and utensils to eat, we’ll still need to bring a pan for whatever we need to cook on the stove. It’s always to have a back-up plan. For example, I normally cook eggs in the pan but if it’s windy one night and we’re having trouble keeping the fire going, at least I can cook the food in a pan. Which then needs to be washed in dried so we need to make sure to bring cloths and dish soap. Garbage bags always come in handy for your garbage, of course. Food and cooler: The best part of it all is the food of course! To keep things simple, I normally bring burgers, brochettes, corn on the cob and vegetables. They are simple to cook and so tasty when cooked on a fire. I can’t forget to bring other necessities such as spices and oils to marinate the food. The cooler should be filled with ice to keep meats and dairy products cold at all time. Personal items: This is where you personal items comes in such as clothes, bathing suit, mosquito repellant, sun screen, soap, shampoo, towels. Most camping grounds do have showers that you can enjoy. If not, you can always stay stinky for a few days. Do avoid bringing perfume based products because it will attract the mosquitoes! All in all, camping is fun and relaxing! To ensure a good trip, do be sure to leave your food in the car at night and tie your garbage back high up to avoid unexpected surprises at night. Enjoy! It wasn’t until yesterday, where I decided to experience Canada’s largest annual community event, the CNE (Canadian National Exhibition). Before even entering the fair, my first thoughts were fried food. I always thought that the CNE was just about trying the up-most craziest fried food there is to experience. Yes, it’s mostly true, but there is also much more than just experiencing the variety of commercial products. It was about enjoying the entertainment and events that the fair offered too. The CNE offers shows such as the strong man show, the human cannonball, the flow-rider, and the skating/acrobatic show. The skating/acrobatic show was what impressed me. I had no idea that the CNE offered such good quality shows. They even had the Canadian Olympian Joannie Rochette join the skating show. Every year, the CNE offers some sort of a new fried food. This year the two main deep fried dishes were deep-fried Cola and the Crispy crème doughnut burger. Of course every person who walks through the gates of the CNE wants to experience these insane deep-fried dishes. And of course I was one of them. Well, I could only go as far as trying the deep-fried Cola, the doughnut burger looked a little nasty to me. I couldn’t bring myself to try a 2000 calories meal. I think my body would go into shock after eating a hefty type of meal like that. After capturing the scenes of people eating, I decided to go on a ride, the Ferris wheel. I am not a big fan for rides at the CNE, but I do love the Ferries Wheel. I feel like the kid inside me comes out. Love it. As the day slowly came to an end, I think my first visit to the CNE was an entertaining one. I’m going on a cruise! While Nara is busy planning her upcoming trip to Peru, I decided to opt for a planning-free vacation instead by booking a cruise to the Bahamas and the Keys. Cruises have never been a priority in terms of travel but given the opportunity, why not try it? So what’s on the menu? A flight to Florida for my best friend’s wedding (woohooo!). While I’m there for 3.5 days, the plan is to party in Miami, spend time calming her before the big day and then party some more at the wedding among friends and family. Following the next morning’s brunch with the newlyweds, off I go to the port in Miami and hop on a cruise. I always thought my first cruise would be in the Mediterranean with my future husband or something like that. A lovely cruise in the Greek islands with a few stops in Turkey. But as we know, we can never plan out our life and we shall take the opportunities as they arise. Which means I’ll be spending my first cruise with my parents. A mini family vacation could be fun too! Initially I thought of taking a road trip down the Keys for a few days. But having done so many road trips in the last few years, I decided to opt for a cruise and try something different instead. It was a good deal for a 4-day cruise and I get to visit two new places, the Keys and the Bahamas. Since this is considered an extension to a wedding trip, the option sounded great. I can’t wait to eat all the food and simply relax! In terms of planning, I need to think about buying travel insurance since I’ll be in the US and it’s the last place I would want to get sick. I could consider a single trip travel insurance in this case since it’s a relatively short trip and a one-time deal. If I had the choice of planning a vacation, I probably wouldn’t be going on a cruise. I’d be going to Malaysia and Indonesia! Or maybe Ethiopia. Or Mongolia 🙂 But life is all about trying new things, right? And… there is always next year for the backpacking trip. When I was a kid I enjoyed traveling with my family, there was always a sense of freedom and exhilaration that came from hitting the road with them. I felt free from the big city. There was always less noise and more peace. The peace always felt like the feeling of the cool wind against my face as I titled my head out the window and closed my eyes. And as I opened my eyes again all I could see for miles would be open terrain. Even when we were to enter some town filled by country bumpkins I would be still stuck in a moment of purely pleasure. I think that’s one of the reasons why now, I have no fear to be surrounded by open land or road. I could drive for miles and just feel free without feeling any type of fear. All worries would leave the mind and all possibilities would enter. As most people say to me “wow how do you just go, like that.” As far as I recall I never thought of it, like that. I thought of it as life. There is so much to see and learn, why not just “Go!” I always saw the world as a wonderland, where fun never actually has to end. It’s the same as a road trip, that feeling of peace. It’s always there; you just have to make time for it. The most important thing I believe in is live life to the fullest! What’s better than spending a day relaxing? That would be spending your day relaxing at the spa. Although I’m not a huge spa fan (my average is once every two years), I do enjoy the experience when I’m there. This year, I decided to try out a spa everyone seems to be talking about in Montreal: Spa Balnea. Spa Balnea is located in Bromont, a town about an hour away from Montreal. I normally drive to Bromont in winter for skiing, but this time I decided to enjoy its summer activities. The drive to the spa once we exited the highway was quite an adventure in itself because we were driving deeper and deeper to the middle of nowhere. But we were happy to finally see the signs of the spa, and even happier when we made it to the counter because the place was absolutely gorgeous. The entrance fee to access the baths is 60$. + TX . It’s a little pricier than most places in the region but with reason. The entrance fee includes your own locker, bath robe, towel and aluminum reusable water bottle. The facilities are new and modern. The women’s changing room also offers hair dryers and hair straighteners in addition to showers. Once you’re ready, an employee will give you a tour of the spa. Some of the facilities include a waterfall, saunas, whirlpools, turkish bath, natural springs, sweat lodge, beach club and a resto-lounge. What I enjoyed the most of this spa is the magnificent view of the lake from the chalet. Unlike most places, you have the luxury to access a lake, a real one! The main area of the spa is at the top of a hill so when you go outside from the patio or when you’re eating at the restaurant, you get a nice view of the lake as well as the surrounding jacuzzi and floating mattresses. By the water, you’ll see a main deck, floating mattresses and multiple smaller decks a few meters away. You can swim and enjoy being in the water as much as you can sit by it. You can go for a swim or simply lay down and enjoy the sun. It’s really up to you! One really cool part of the spa I haven’t seen anywhere else is the movie room. It’s basically a mini movie theatre where they were playing Planet Earth documentary. Every seat has earphones and you can sit there for as long as you want. I’m a sucker for documentaries so I probably stayed there for almost an hour. It’s a great option for when the sun goes down. Although I didn’t get to experience any of the services (massages, pedi/mani) I must say that I had a fantastic spa experience at Balnea. We stayed there for 5 hrs and it was well worth the entrance fee. I rarely felt that relaxed when walking out of a spa. Since my friend landed a job in marketing at a major airline company, I, as her friend, benefit from some of its perks. 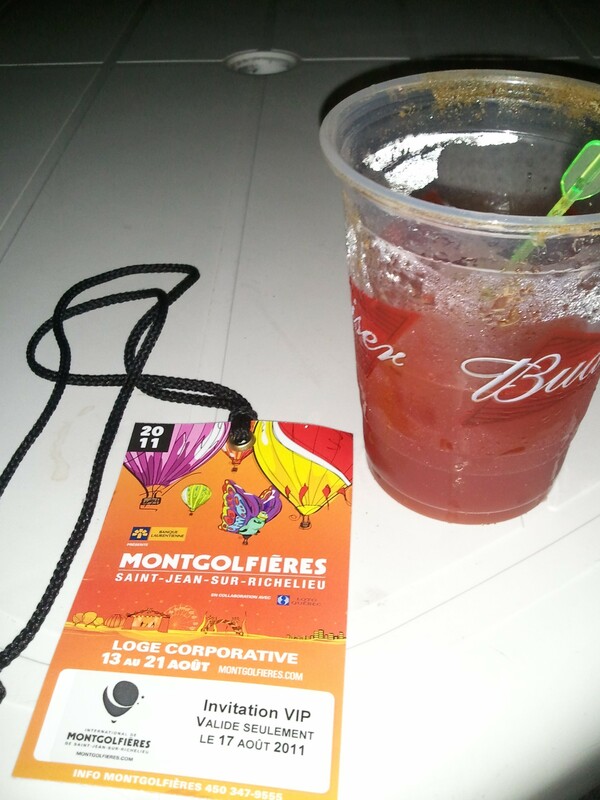 Every now and then, she’ll get tickets for events in the Montreal area and so, on Wednesday, four of us had VIP treatment at the Sean Paul concert at the Festival des Montgolfieres in St-Jean-sur-Richelieu. This hot-air balloon fest is the biggest of its kind in Canada. It attracts over 40,000 visitors yearly, from family to friends to couples. It’s 5:45pm, I fly out of the office and head to my friend’s house so we can hop in the car and hit the road! The drive to St-Jean-sur-Richelieu is about an hour, with an extra 15 mins because we managed to get lost on the way. We`re four girls of course! Having VIP passes to the event, we skipped the parking headache and headed straight to a reserved area. It was around 8:15pm when we parked and all four of us were starving by this time. We were an hour late for the buffet but who was counting? (Ok, maybe are stomachs were growling a little) As we walked towards the loge area, it seemed like I was on a tv show. I felt like I was at one of those town fairs with rides, people and food! I felt like a kid all over again! We finally made our way to the loge which was located right by the stage. Luckily for us, there was still some food left so we got to enjoy the couscous salad, pasta salad, fish, brochettes and olives. The desert table had a sugar pie, chocolate cake and carrot cake. (Our stomachs were delighted!) But what really made our night was the open bar. We weren’t expecting it but we remained quite satisfied with the extra perk! As we waited for Sean Paul to start rockin’ the house, the hot-air balloons would illuminate all at the same time. It was so beautiful to see! After a few minutes of waiting and laughing, he finally came onstage and we enjoyed his Jamaican influenced songs for the next hour and a half. We were all reminiscing our clubbing days in college. Man I’m getting old! All in all, it was good music, good music and most importantly, great company! It was a great night among girls! Enter your email address to subscribe to OTB and receive notifications of new posts by email. IT’S ALL BOOKED! … part two.